현재 남아있는 신라 석탑 가운데 가장 오래된 걸작품으로, 돌을 벽돌 모양으로 다듬어 쌓아올린 모전석탑(模塼石塔)이다. 원래 9층이었다는 기록이 있으나 지금은 3층만 남아있다. 탑은 넓직한 1단의 기단(基壇) 위에 3층의 탑신(塔身)을 착실히 쌓아올린 모습이다. 기단은 벽돌이 아닌 자연석으로 이루어져 있고, 네 모퉁이마다 화강암으로 조각된 사자상이 한 마리씩 앉아있다. 회흑색 안산암을 작게 벽돌모양으로 잘라 쌓아올린 탑신은 거대한 1층 몸돌에 비해 2층부터는 현저하게 줄어드는 모습을 보이고 있다. 1층 몸돌에는 네 면마다 문을 만들고, 그 양쪽에 불교의 법을 수호하는 인왕상(仁王像)을 힘찬 모습으로 조각해 놓았다. 지붕돌은 아래윗면 모두 계단 모양의 층을 이루고 있는데, 3층 지붕돌만은 윗면이 네 모서리에서 위쪽으로 둥글게 솟은 모양이며, 그 위로 화강암으로 만든 활짝 핀 연꽃장식이 놓여 있다. 선덕여왕 3년(634) 분황사의 창건과 함께 건립된 것으로 추측되며, 비슷한 시기에 만들어진 익산 미륵사지 석탑(국보 제11호)과도 좋은 대조를 이룬다. 특히, 부드러우면서도 힘차게 표현된 인왕상 조각은 당시 7세기 신라 조각양식을 살피는데 좋은 자료가 되고 있다. 1915년 일본인에 의해 수리된 이후 지금까지 그 모습을 유지하고 있으며, 수리 당시 탑 안에서 사리함과 구슬 등의 많은 유물들이 발견되었다. 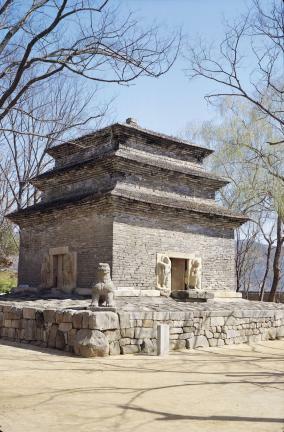 This pagoda was built with bricks made by trimming natural stones, in 634 (the 3rd year of the reign of Queen Seondeok of the Silla Dynasty) at the time of the foundation of Bunhwangsa Temple. 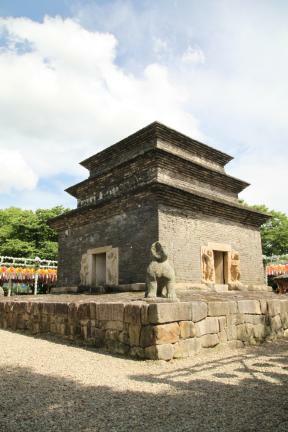 It is the oldest extant stone pagoda erected during the Silla Period. 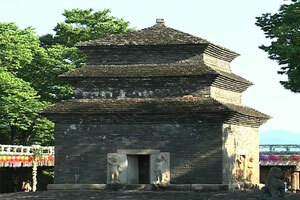 According to one ancient record, the pagoda originally consisted of nine stories, although only three stories remain. 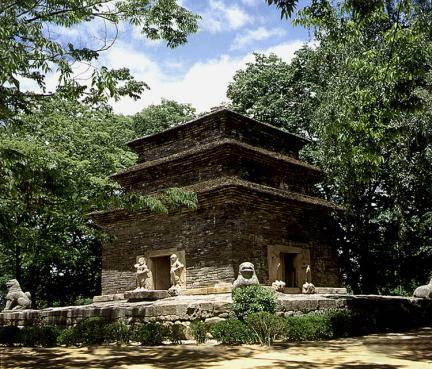 The pagoda was repaired by the Japanese in 1915, and has been well preserved since then. 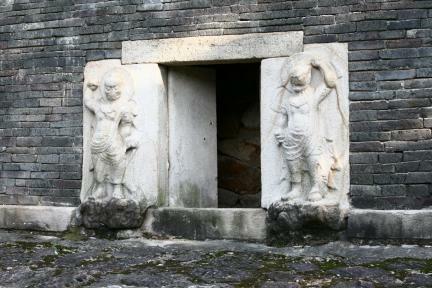 At the time of the repair work, many Artifact such as reliquaries and beads were discovered inside the pagoda. 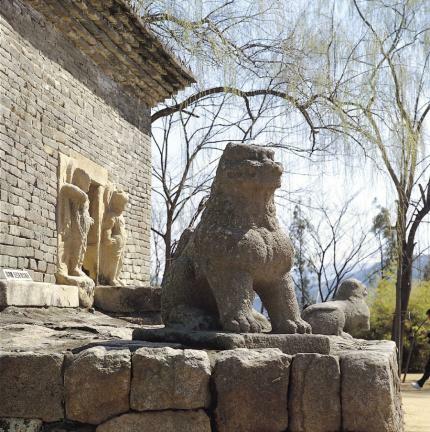 The three-story body, which was built with brick-shaped stones, stands on a wide single-story platform made of natural stones, with a granite lion statue sitting at each of its four corners. 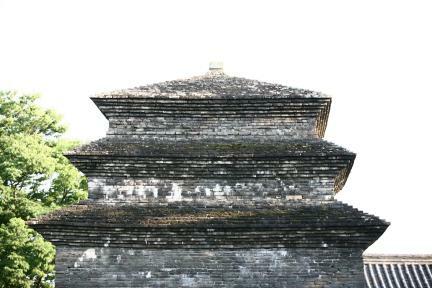 The surviving three stories of the pagoda were built with small brick-shaped stones trimmed from black andesite. The first-story main body of the pagoda is huge, but the size of this pagoda remarkably reduces from the second story. 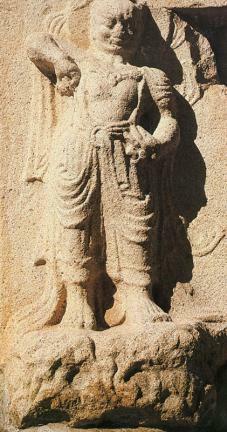 Each face of the huge first-story main body has a gate flanked by a statue of the Benevolent King, the Buddhist guardian deity. 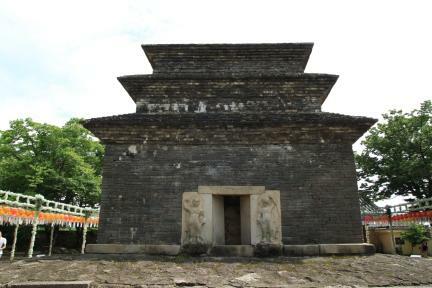 The roofstone is similar to that of a brick pagoda in that it has staircase-shaped stories at both the upper and lower parts. 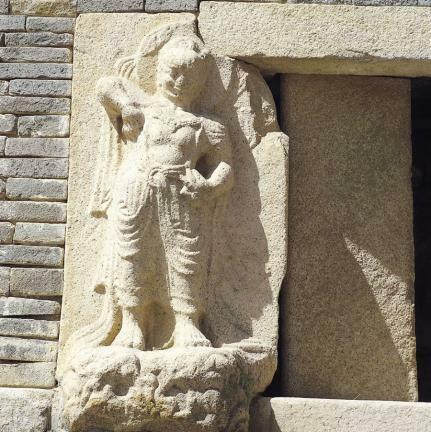 The four corners of the third-story roofstone are slightly raised, and a granite ornament in the shape of a lotus flower is placed on the top of this roofstone. 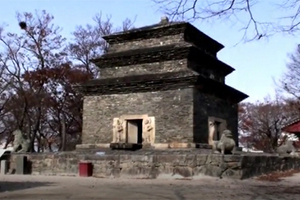 As the oldest surviving Silla pagoda, it is often compared with the Stone Pagoda at Mireuksa Temple Site, Iksan (National Treasure No. 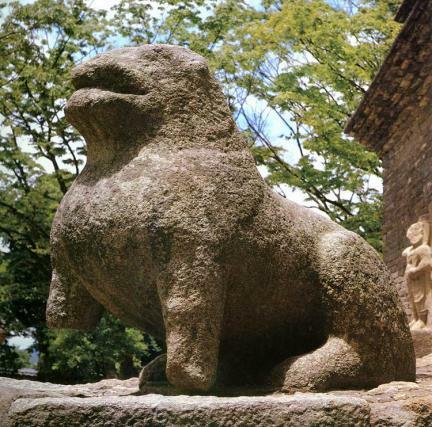 11), which was built in the same period in Baekje. 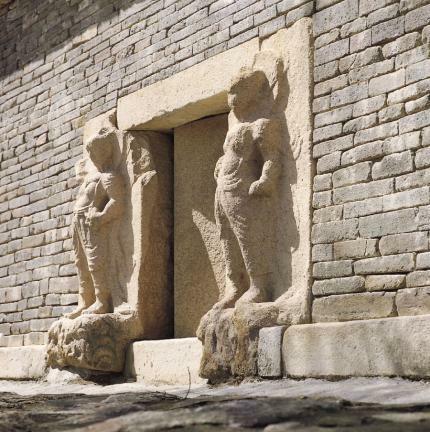 Notably, the elegant but strong statues of the Benevolent King are regarded both as masterpieces and as valuable sources of information on the carving styles of 7th-century Silla.